Walaupun mikrokontroler yang satu ini excellent, populasi pemakai di Indonesia, tidak terlalu banyak. Mungkin dikarenakan faktor harga, yang umumnya, hampir 2-3 kali lipat dibanding produk yang setara keluaran Atmel. Namun perlu dicatat, harga chip Atmel yang murah yang banyak beredar di Indonesia, adalah produk dengan kualitas kelas dua; sementara PIC hanya menyediakan kualitas satu. Chip Atmel kualitas satu harganya kurang lebih setara dengan chip PIC. Ada beberapa jenis yang walaupun agak sulit ditemukan, tapi bisa dicari, seperti PIC 16F877A dan PIC 16F84A. Untuk pemula, PIC 16F88 bisa disarankan, karena sudah memiliki internal ADC (7 channel) dan menyediakan fasilitas PWM walaupun cuma satu. Bandingkan dengan PIC 16F84A yang hanya menyediakan input digital saja. Mikrokontroler ini agak sedikit unik. Saya sebut unik karena sangat berbeda dengan pakem Intel yang selama ini kita ketahui. Yang menarik lagi adalah, instructions set nya cuma 35 (low end) hingga 80 (high end) saja. Ini pula yang disebut sebagai “keterbatasan” selain cuma memiliki akumulator tunggal. This powerful (200 nanosecond instruction execution) yet easy-to-program (only 35 single word instructions) CMOS FLASH-based 8-bit microcontroller packs Microchip’s powerful PIC® architecture into an 40- or 44-pin package and is upwards compatible with the PIC16C5X, PIC12CXXX and PIC16C7X devices. 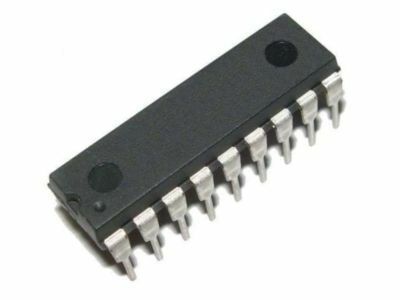 The PIC16F877A features 256 bytes of EEPROM data memory, self programming, an ICD, 2 Comparators, 8 channels of 10-bit Analog-to-Digital (A/D) converter, 2 capture/compare/PWM functions, the synchronous serial port can be configured as either 3-wire Serial Peripheral Interface (SPI™) or the 2-wire Inter-Integrated Circuit (I²C™) bus and a Universal Asynchronous Receiver Transmitter (USART). All of these features make it ideal for more advanced level A/D applications in automotive, industrial, appliances and consumer applications. This powerful (200 nanosecond instruction execution) yet easy-to-program (only 35 single word instructions) CMOS FLASH-based 8-bit microcontroller packs Microchip’s powerful PIC® architecture into an 28-pin package and is upwards compatible with the PIC16C5X, PIC12CXXX and PIC16C7X devices. The PIC16F872 features 64 bytes of EEPROM data memory, self programming, an ICD, 5 channels of 10-bit Analog-to-Digital (A/D) converter, 2 additional timers, a capture/compare/PWM functions and the synchronous serial port can be configured as either 3-wire Serial Peripheral Interface (SPI™) or the 2-wire Inter-Integrated Circuit (I²C™) bus. All of these features make it ideal for more advanced level A/D applications in automotive, industrial, appliances and consumer applications. This powerful (200 nanosecond instruction execution) yet easy-to-program (only 35 single word instructions) CMOS Flash/EEPROM-based 8-bit microcontroller packs Microchip’s powerful PIC® architecture into an 18-pin package. The same device can be used for prototyping and production and the end application can be easily updated without removing the device from the end product via the ICSP. Easily adapted for automotive, industrial, appliances low power remote sensors, electronic locks and security applications. Untuk informasi lebih lanjut mengenai chip PIC dan pelatihan pemrogramannya, silahkan menghubungi NEXT SYSTEM Robotics Learning Center.